In all of my gift guide hunting I have stumbled across some really terrific things that would make a great gift for yourself. They are gifts for the home that are as admirable for their form as they are for their function. First up, my most favorite Internet find in some time… When I discovered this I was so excited that I have shown it to just about anyone who will give me two minutes of their time. Is it kind of crazy expensive? Yes. Is it beyond cool? Double Yes. 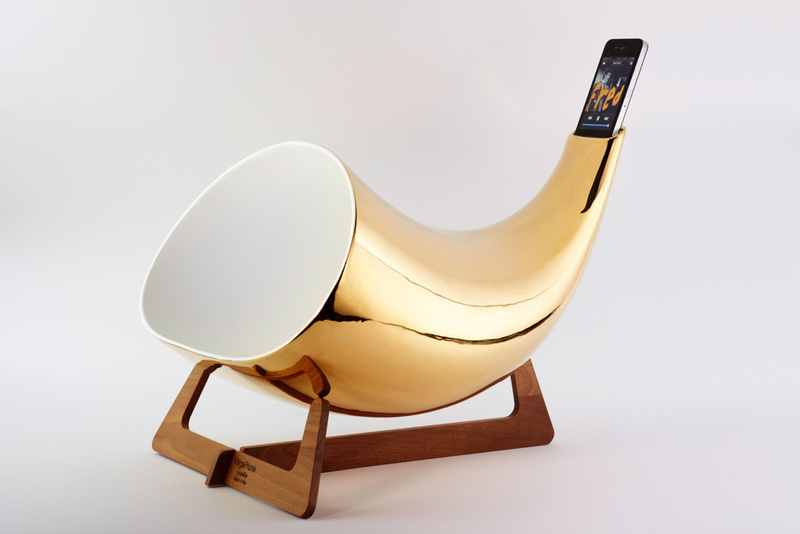 This ceramic megaphone, made in Italy, is the old school speaker for your iPhone. Drop the i-phone in the “mouth piece” and sound comes booming out in a mega way. The design is sleek and cool, it’s reminiscent of the chicest Shofar you never did see. I love the idea that this would be resting incognito on a mantle or shelf and all of a sudden become the life of the party. What do you think? Do you want to dance all night with this? This entry was posted in Decor, gifts, Her Home and tagged art for home, en&is, iphone megaphone, iphone speakers, italian megaphone. Bookmark the permalink. I bought one 2 weeks ago and believe me, if you like it from the picture you can not imagine what means having in your hands. Stunning design, incredible WARM sound… it will amplify my Christmas songs as… 70 years ago!